For every job opening today, there are more than five job seekers, according to the Bureau of Labor Statistics. So what does it take to compete and— more importantly—win in the toughest job market in decades? The answers await at the Dulye Leadership Experience (DLE). The DLE, now in its sixth year, offers practical techniques, hands-on knowledge and an extensive network to help SU students successfully transform from college graduates to workplace professionals. This groundbreaking training program is planned, staffed and funded by its founder, Linda Dulye, a 1977 graduate of Syracuse University. Dulye, an internationally recognized leader in workplace communication and engagement, wanted to zap the uncertainty that overwhelms many college students about their future careers. The 2013 DLE program is set for March 22-24. “Students often narrow their job pursuits to match their academic fields of study. Most don’t broaden their view about where or how their skills align with different industries, corporations or functions,” notes Dulye, who is president and founder of Dulye & Co., a leading change management consultancy based in Warwick, N.Y.
Dulye founded the DLE in 2008 with the support of SU’s College of Arts and Sciences and Whitman School of Management. More than 60 students have completed the program and successfully landed jobs with powerhouse firms such as GE, JPMorgan Chase, Fox News Corp., GEICO, DRS Technologies and more. The program’s distinguished faculty includes business executives, entrepreneurs and recognized experts from diverse industries and organizations. Each faculty member volunteers more than 50 hours of personal time to participate in a three-day, transformational boot camp. Supplemental mentoring is another program bonus whereby DLE participants engage faculty, on an anytime basis, for advice and preparation for job interviews, compensation discussions and career changes. The mentoring agreement extends for the long run, which keeps the value and benefits of DLE participation soaring even after a student’s graduation from SU. Selection to the DLE is based on three key factors: work and internship experience, community service and academic performance. From a pool of more than 100 annual applicants, semifinalists are selected for an in-person interview with selected faculty. Those who emerge as finalists represent a variety of majors, including engineering, business, communications, sports marketing, arts and sciences, political science, fine arts, architecture and more. The application deadline for the DLE 2013 program is Dec. 31. The application can be found here. Selected students receive an all-expense-paid scholarship to a three-day training program off campus, where the instruction focuses on resume-building, interview skills, effectively communicating, networking, learning company culture, developing personal finance values, understanding business finance and career development. A Fox Business columnist and sought-after public speaker, Dulye has earned international recognition for helping Fortune 500 organizations improve performance using her firm’s Spectator-Free Workplace™ program for effective communication and engagement. 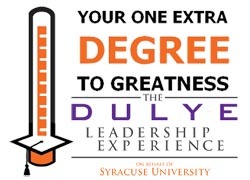 For more information about the Dulye Leadership Experience, contact Lisa Balogh in The College of Arts and Sciences at 315-443-2212 or lbalogh@syr.edu.